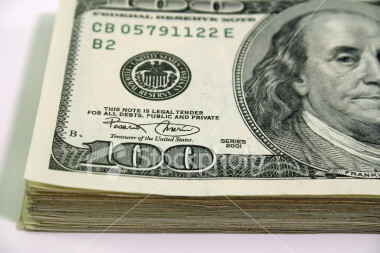 Even though western powers have requested that their funding be used for non-terrorism related purposes, any financial assistance given to the Palestinian Authority frees up other funds to be used for supporting terror and paying terrorist salaries, as Palestinian Media Watch has documented. Therefore, any financial assistance given to the PA that is not conditioned on the cessation of incitement indirectly funds terror and hate promotion. "Belgium has decided to upgrade the diplomatic status of the Palestinian representative office in Brussels, according to a joint statement issued on Wednesday. This was announced following a meeting between Foreign Minister Riyad Malki and his Belgian counterpart Didier Reynders and Minister of Cooperation and Development Alexander De Croo in Brussels. The two sides signed a joint declaration following their ministerial dialogue in which they affirmed their desire to develop bilateral relations in several fields, stressed their intention to consolidate the cooperation agreement signed between the Kingdom of Belgium and the Palestine Liberation Organization on 12 November 2001 on behalf of the Palestinian Authority and expand it to include support for Palestinian schools in East Jerusalem as well as development projects in the Palestinian territories, especially in areas C of the West Bank, which is under Israeli military control, and the Gaza Strip. The two sides also decided to elevate the level of Palestinian diplomatic representation in Belgium and provide support and training to Palestinian diplomats." “[PA] Minister of Education and Higher Education Sabri Saidam said that Britain has again committed to supporting education in Palestine through several plans and projects whose goal is to advance this essential sector. “[PA] Minister of Education and Higher Education, [Fatah Central Committee Deputy Secretary, and Fatah Revolutionary Council Deputy Secretary] Sabri Saidam announced today (Saturday) [Nov. 25, 2017] that Britain has agreed to pay its annual contribution of 20 million pounds, which is allocated to support the [PA] general budget of Palestine. Part of it will be allocated for the education [sector], as an affirmation of [Britain’s] commitment to support this sector and efforts to develop it and improve its accomplishments. This was said during a phone call that Saidam received from B ritish Minister [of State for the Department for] International Development Alistair Burt. 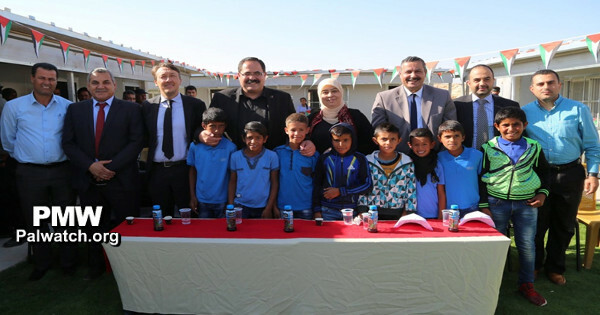 Saidam emphasized that the donors’ continued support for the education [sector] proves the confidence in the Palestinian [PA] education system, its efficiency, and its ability to record quality achievements. “The Women’s Affairs Technical Committee (WATC) condemned the accusations of incitement and violence that were directed against it by a group of donor states that constitute the H uman Rights and International [Humanitarian] Law Secretariat, including Denmark, Holland, Sweden, and Switzerland. These states stopped funding the committee because it established an empowerment center for women and young people in the village of Burqa, north of Ramallah, which is named after Martyr (Shahida) Dalal Mughrabi (i.e., terrorist who led murder of 37, 12 of them children. PMW exposed the naming of the center, which led to widespread condemnation from donors and demands for the funding to be returned.) – which according to them is considered incitement and encouragement of violence. In a statement that was distributed at a press conference held at the committee’s headquarters in Ramallah today, Sunday [Oct. 29, 2017], the committee condemned the donor states’ decision..."
"[PA] Minister of Education and Higher Education Sabri Saidam today, Wednesday [Oct. 18, 2017], inaugurated Defiance 6 Co-ed Elementary School in the Wadi Al-Sik area, east of the village of Deir Debwan in the Ramallah and El-Bireh district – and this was funded by the European Union. Participating in the opening were District Governor of Ramallah and El-Bireh Laila Ghannam, Representative of the Belgian [Development] Cooperation Institution Eric De Muynck, Director of International Relations and Public Relations in the [PA] Ministry of Education Nadim Sami, Director of the Ramallah and El-Bireh Directorate of Education (i.e., branch of the PA Ministry of Education) Bassem Erekat, and representative of the Committee to Resist Settlements and the Wall Abdallah Abu Rahma.'" “The [PA] Ministry of Education and Higher Education… expressed great sorrow over the temporary freeze of the Belgian aid to build two schools due to the reservations regarding the name given to one of the schools (PMW exposed that the school was named after terrorist Dalal Mughrabi who led the murder of 37, 12 of them children –Ed.) 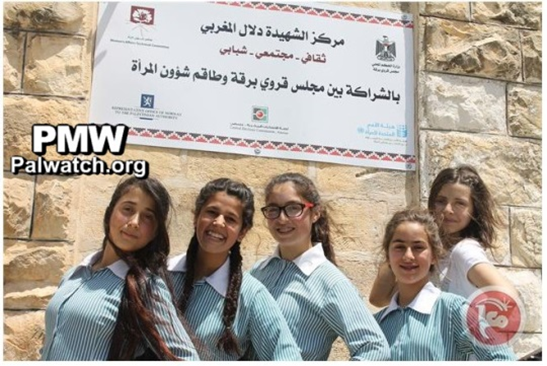 that were built five years ago with Belgian aid in the village of Beit Awwa, which is part of the Southern Hebron [Education] Directorate (i.e., under the PA Ministry of Education). 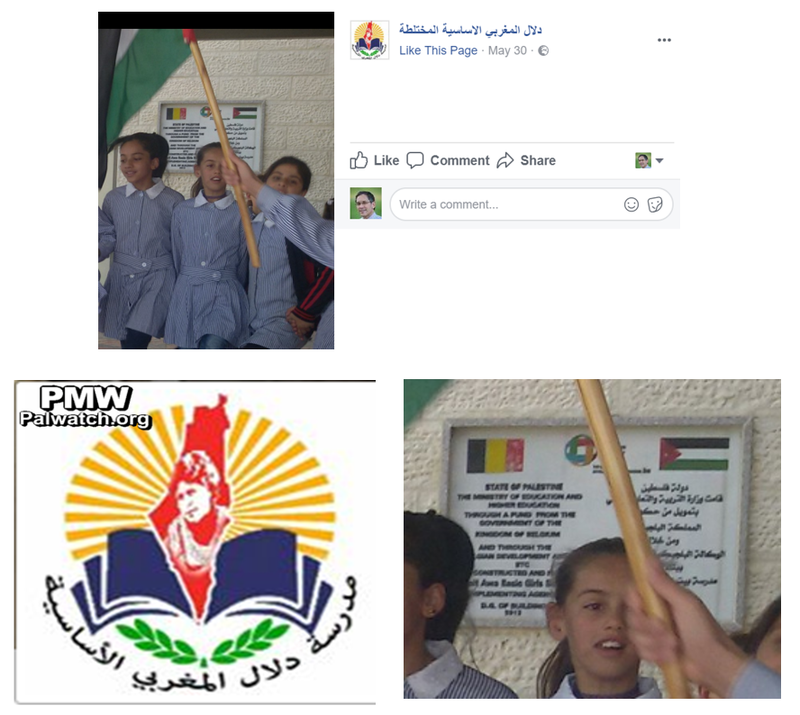 Note: PMW exposed the naming of a Belgian-funded school after terrorist Dalal Mughrabi, who led the murder of 37. This led to condemnation by Belgium and a temporary freeze to Belgian funding of PA school construction projects. Beit Hadassah (Daboya) terror attack – Terror attack in which 6 Israeli young men were murdered: Tzvi Glatt, Eli HaZe’ev, Shmuel Marmelstein, Hanan Krauthhammer, Gershon Klein and Ya’akov Zimmerman, and 20 were wounded on May 2, 1980, in Hebron, near Beit Hadassah - the only building in Hebron in which Jews lived at the time. The Palestinian terrorists who committed the attack were Adnan Jaber, Yasser Ziyadat, Tayseer Mahmoud Taha Abu Sneineh, and Muhammad Abd Al-Rahman Saleh Al-Shubaki. “The European Union said that it will pay its third annual donation for this year  as part of its direct financial support for the PA. 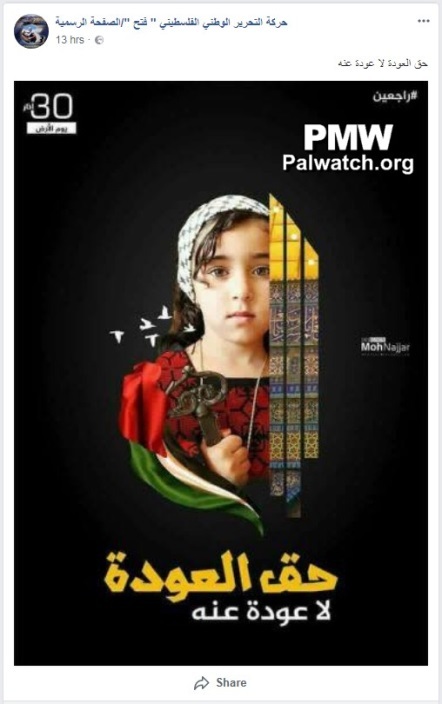 Note: PMW's report on the PA's education system has proven that the PA educates towards hatred and incitement against Israel. Head of village council repeats name of center named after terrorist won't be changed, would rather return the money than give in to "conditional funding"
“Chairman of the Burqa Village Council Sami Daghlas… explained to a reporter from [the independent Palestinian news website] The Palestinian Information Center that... the position of the Palestinian [PA] Ministry of Foreign Affairs - which noted the [Dalal Mughrabi] Center (i.e., terrorist who led murder of 37, 12 of them children) in its statement - is not enough, and that it is necessary to carry out an active diplomatic operation and make contact with the Norwegians and invite them to visit the center so as to get to know the truth from up close. “Director of the settlements issue in the northern West Bank [for the PA] Ghassan Daghlas said that the Israeli campaign against the Dalal Mughrabi Center (i.e., terrorist who led murder of 37, 12 of them children) in the village of Burqa, west of Nablus, is meant to disrupt the relations between the European Union and the PA. Headline: "Saidam briefed a Finnish official regarding the state of education in Palestine"
"[PA] Minister of Education and Higher Education Dr. Sabri Saidam today, Tuesday [May 16, 2017] briefed Deputy Director General of the Department for Africa and the Middle East in the Finnish Ministry for Foreign Affairs Kristiina Kuvaja-Xanthopoulos on the state of education in Palestine, and emphasized the ongoing partnership that guarantees the advancement of the education system. Regarding this, Saidam praised the partnership with Finland that stands at the head of the joint funding basket that includes Finland, Ireland, Belgium, Germany, and Norway, and emphasized the ministry’s dedication to developing and strengthening the relations of cooperation with all of the friendly states." PMW note: Shortly after PMW reported on this center, Norwegian Foreign Minister Børge Brende condemned the center and demanded that the Norwegian money be returned. The UN, including UN Secretary General Antonio Guterres, also condemned the decision. Shortly afterwards, Denmark also demanded its funding be returned. Despite the pressure, the center responded that it would not change its name. Headline: "The Committee for Women's Affairs inaugurated a women's center in Burqa"
"The Women’s Affairs [Technical] Committee, today, Monday [May 15, 2017], inaugurated the Martyr Dalal Mughrabi Center (i.e., terrorist who led murder of 37, 12 of them children) in the village of Burqa in the Nablus district... This building will be used to hold social activities and activities for women and youth… Reem Hajje, a member of the village council, noted that the center will focus especially on the history of the struggle of Martyr Dalal Mughrabi and on presenting it to the youth groups, and that it constitutes the beginning of the launch of enrichment activities regarding the history of the Palestinian struggle." 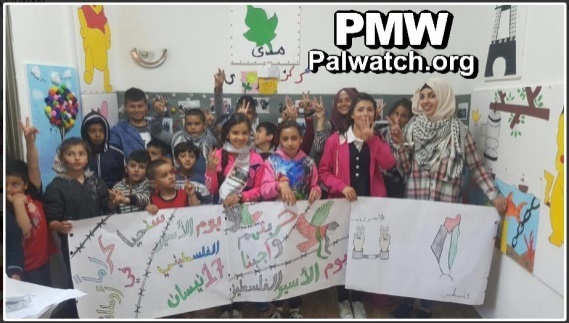 In Wadi Hilweh, the library of Madaa organized a children's seminar, in which about 20 children participated; there was a discussion between the children and the librarian about the Palestinian prisoners and their numbers inside the Israeli jails, and about the prisoners' strikes and demands. The children asked questions, then sang songs for the prisoners, and wrote letters to them that they hung on the library wall. As for the branch of Madaa Center in Batn Al Hawa, the staff organized a session with the children where they talked about the suffering of the prisoners and their families, especially during visits, and about our duty as a society towards them. Forty Palestinian children released balloons that carried a name of a Palestinian prisoner on each one, and chanted ‘O Darkness of Prison Tents’ and drew drawings depicting the prisoners. The aim of today’s activities was to familiarize children with a number of prisoners in Israeli jails and to reinforce their cause in the minds of the children. “It would appear that the salary crisis has cast its shadow over all of the Palestinians, and as part of the ongoing responses to the reduction of the salaries of the [public] employees in Gaza, the European Union has denied any connection to the Palestinian [PA] government in Ramallah's decision regarding a reduction of the salaries of the PA employees in Gaza.